The three maps listed here are from two different series, for Kent and London, and so the sheetlines are somewhat different. The Kent series maps are centred on the village - and later town - centre of Beckenham. The earliest map was surveyed in 1861 but was updated to 1871 to include railways. Features include Coperscope, Beckenham station (still with an overall roof), and the map stretches as far as New Beckenham Junction to the north. Westward the map stretches to the boundary with Penge, eastward it reaches Foxgrove. This is an attractive map of Beckenham as development was just beginning. The companion map showing it in 1930 provides a fascinating illustration of how the village developed into a town. The map links up with Kent Sheets 7.14 Anerley & Penge to the west and 7.16 Bromley to the east. You might find this Index map useful. 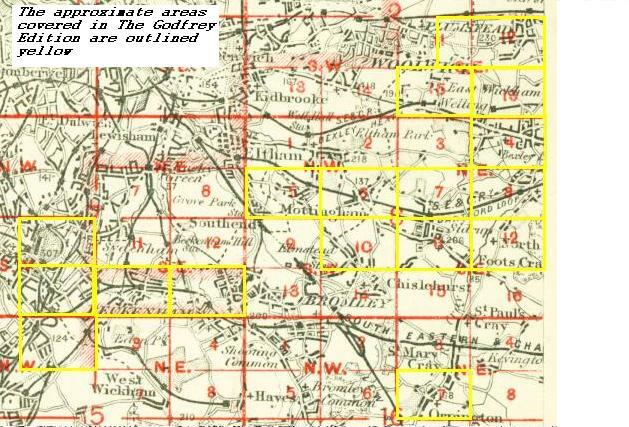 The sheetlines for the 1894 map are slightly different and is really centred on New Beckenham. Coverage stretches from Penge station eastward to Beckenham Junction station, and southward to Clock House station. The town centre of Beckenham is therefore in the lower right corner of this map. By 1894 Beckenham had grown into a town and this map is much more built up than the 1861 version. Features include the railway layout, with Kent House and New Beckenham stations, the eastern part of Penge, Kent House Farm, St George's church, St Paul's church, Holy Trinity, St John's Penge church, the Royal Asylum almshouses at Penge. Streets include part of Beckenham High St, Coperscope Road, Lennard Road, Ravenscroft Road, Parish Lane, Beckenham Road and many more. The map links up with London Sheets 138 Lower Sydenham to the north, 145 Crystal Palace to the west and 147 Bromley Park to th east.